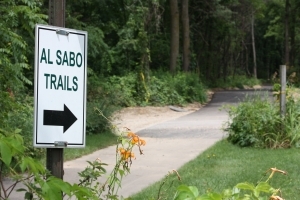 The Al Sabo Trail is a very sought after trail system in the community. Albert Sabo served as the Director of the City’s Utilities Department for 15 years, and was employed by the city from 1922 until 1969. It was Sabo’s insight that initiated the purchase and preservation of this land. In 1992 the preserve was closed due to excessive erosion. The sport of mountain biking had taken a toll on the trails of Al Sabo. After many Saturdays of volunteer restoration work, the preserve was opened in 1993. As a condition of the preserve’s re-opening, bicycles are restricted to approximately seven of the 25 miles of trails.